Wow, it’s been a long time since I have shared a cookie recipe! And these are not just any cookies. They aren’t just pudding cookies with blueberries. Finally, they are a cookie that Paul will actually eat! His sweet tooth is as nearly non-existent. This poses a problem for a girl who likes to bake! I have tried and tried over the years but most of the time he doesn’t even place a finger near the sweets I make. These, however, he has devoured since they came out of the oven over the weekend. The funny thing is that the cookie base is the same that I have used for a lots of cookies in the past: cinnamon toffee cookies; cinnamon chip cookies; peanut butter tagalong pudding cookies. I asked him what he liked so much about these and he said, “I just love blueberries!” So there it is. Blueberries have been the key all along. The cookies even inspired him to make blueberry pancakes for his men’s breakfast on Monday morning. I’ll call that a win. The cookies are soft and sweet with a little pop from the dried blueberries. The whole time I photographed them I was thinking of additions – white chocolate, vanilla bean, lemon zest, and so on. I guess there will just have to be a second batch of these very soon. 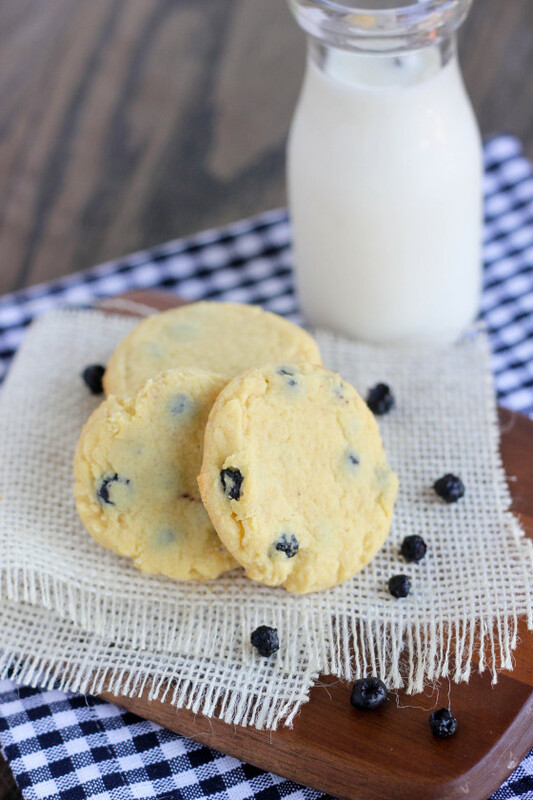 Simple, sweet vanilla pudding cookies with dried blueberries. Preheat the oven to 350 degrees. Line two large cookie sheets with parchment or silicone liners. Mix the flour, pudding mix, baking powder and salt in a medium bowl. In the bowl of a stand mixer, cream together the butter and sugars for about 3 minutes until very smooth. Add the eggs, one at a time until fully incorporated and then mix in the vanilla and mix for about 4 minutes on medium speed until the mixture is smooth and fluffy. Add in the dry ingredients and mix just until combined. Stir in the blueberries. Scoop the dough out onto the prepared cookie sheets (I used a small cookie scoop). Bake for 10-12 minutes, just until the cookie edges start to brown. Cool completely on the cookie sheet. I chose dried blueberries for these cookies because they are a pantry staple for us. They don't bust and bleed into the rest of the dough like fresh berries do. If you prefer fresh, try popping them into the freezer for a while before adding them to the dough and then very gently stir them in. I have not tried this recipe with fresh blueberries so I'm not sure what the final result is like. I just made my first pudding cookies this weekend (lemon) and am obsessed (shhhh I’m having one with bfast right now). Next time, I’m adding blueberries too. YUM! Some of my favorite cookies are made with vanilla pudding mix. What is it with those mixes, they sure make cookies good. I love that you adding dried blueberries. Just recently I had chocolate covered blueberries which were the best treat I’d had in a long time. I’m tempted to try your recipe with those. I love pudding cookies, but these look so delicious! Blueberries and vanilla are such a great combination. Can’t wait to try this one out! Adding pudding to cookies is the best discovery ever! These look fantastic, Cassie! Sharing! These sound great! I love the variations you provided with lemon and white chocolate. Going to have to make these! I just recently discovered the magic that is blueberries in cookies — SO yum. I can only imagine how much better they taste in pudding cookies! I love dried blueberries in cookies! Delicious!! How did you know that I was craving a cookie with blueberries? This is why I heart you! Whoa. Love the combo of blueberry and vanilla. How fabulous! Easy enough for the kids to make too. Have a wonderful Wednesday Cassie! These sound so delicious – my son is obsessed with “boo-berries” lately!! I’ve been hearing about this pudding secret for a while, I’m so intrigued! It looks like they yield perfect cookies!! Made these today. I used fresh blueberries that were frozen. Turned out yummy. The next time I make these I think I will try lemon pudding mjx for a little more of a twist. 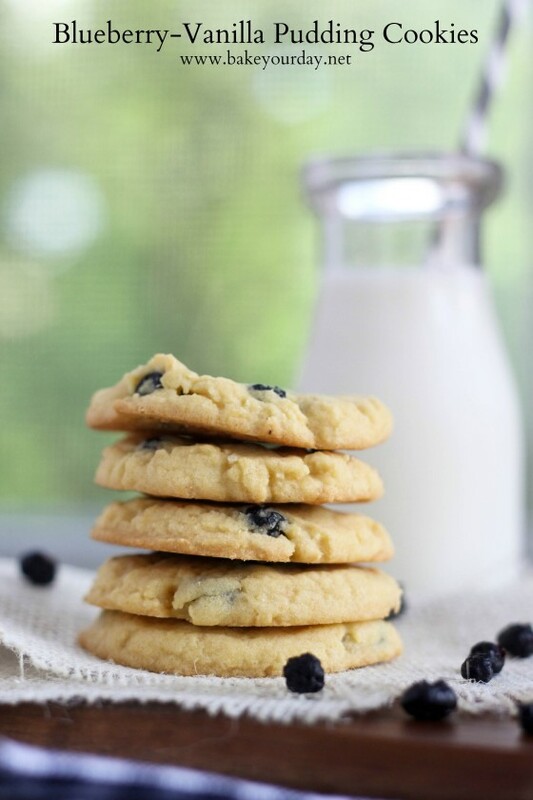 You can`t go wrong adding blueberries to cookies! Especially cookies that inspire people to make blueberry pancakes afterwards! Blueberry and vanilla — a winning combination! I love the fresh, fruitiness of these summertime cookies, Cassie! 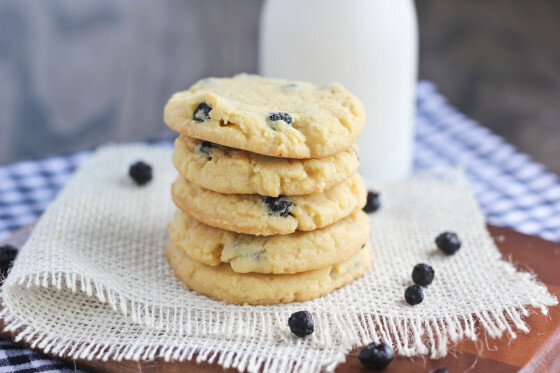 Blueberry and vanilla is such a great combo, these cookies look so good! Definitely something I’d inhale straight from the oven! I’ve made these at least 3 times now and they have been very popular each time. I even did them gluten-free using a GF flour blend. I have a vanilla pudding that is GF too. It worked great and several folks mentioned “you can’t even tell these are GF!” I’m not sure if the pudding helps with that or the flour blend I use or just the nature of the cookie but it’s a great recipe. Thanks! !